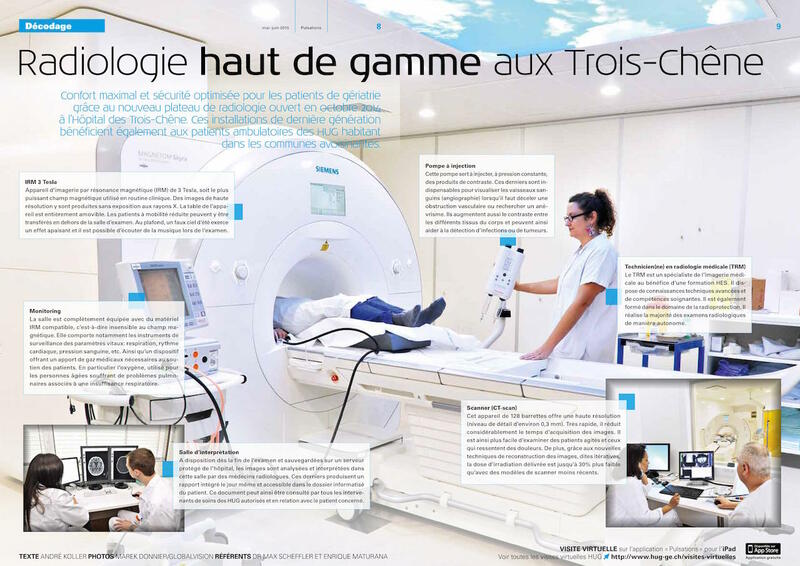 For 4 years, globalvision has worked with the Geneva University Hospital (HUG) in order to realize 360° virtual tours of the different services in the hospital. The goal of these virtuar tours is to make people aware of the hospital environment. The visitor can discover a place in 360° through a simple and intuitive interface. Some point of interest are highlighted with information coming over the screen. A pregrant woman can prepare peacefully her baby’s delivery by visiting the maternity. An other patient can virtually visit the radiology service or discover the advanced medical equipment. The virtual visit is accessible through your computer, tablet and smartphone and from the HUG app. Every two months, the paper format of the virtual visit in Pulsation, the magazine of the HUG. To know more about virtual tour, simply contact us.